Since it’s not quite so cold you need it yet, you can prepare your unit to make sure it is ready for the cold months ahead! 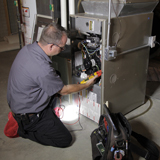 Make sure to check out these tips BEFORE you finally turn your furnace on. While we can't tell you exactly how to install an air conditioner, we can tell you what methods to avoid... Here's what NOT to do! It's warming up outside, which probably means it's cooling down inside! If you're finding yourself shivering at work this summer, this post is for you! Here's how to survive your office air conditioning. Is your air conditioner an eyesore? Here are the top 5 things to look out for when landscaping around your AC unit! Do you have difficulty controlling your home temperature? A programmable thermostat can help you with your home temperature problems- here are the top 5 benefits of a wi-fi thermostat! So you already have an air conditioner, but want to make the most of it? No problem, here are 6 things you can do to make the most of your AC! Your Air Conditioner: Should you REPAIR or REPLACE it? You want to make sure that your AC is ready for all of your summertime get-togethers! Use the answers to these 5 questions to help you determine whether you need to repair or replace your system. Type 39436 and click "Submit"
Type 81721 and click "Submit"